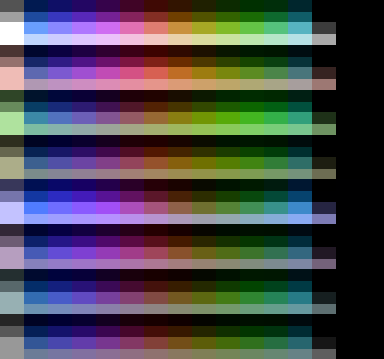 Reading the NTSC encoder page at http://wiki.nesdev.com/w/index.php/NTSC_video , I decided to create my own palette synthesizer based on the description. I first looked upon Blargg's nes_ntsc, but it seems to use a sinewave rather than the described squarewave for the color synthesis. // We need RGB values. Convert the index into RGB. // the exactly same result, scaled by a factor of 2*cos(pi/12). // Convert YIQ into RGB according to FCC-sanctioned conversion matrix. EDIT: Not to accuse nes_ntsc of anything. I did not compare the results, and it may very well do the very same thing through precalculated mathematics; I just thought it'd be good idea to actually replicate the process in detail. Also, this function is not meant to be called for each pixel. 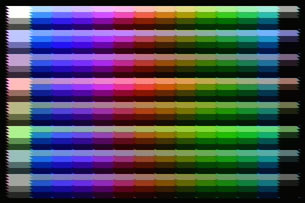 Ideally, you would precache the colors or calculate&cache them as needed. pointed out in beannaich's post(s), below. EDIT: Replaced the attenuation code with single-attenuator and updated the screenshot. This addresses the problem with whether the combination of de-emphasis bits works properly or not. Last edited by Bisqwit on Sun Oct 16, 2011 11:36 am, edited 7 times in total. One of the biggest problems I can see with this already is that color $20 is slightly off, $20 is $FDFDFD. Colors $xE and $xF are also incorrect, they should be flat black, but they are $050505. The above matrix was created by simplifying and inverting the RGB to YIQ matrix described here (Number 20). So far it looks pretty good though, aside from the slight errors previously noted. I actually did write that I intentionally extended the range very slightly (for debugging or other quirk purposes). The "black" and "white" variables control that. To get the function you describe as correct they should be set .518f and 1.962f respectively. And probably the last "signal high" value sehould be set to 1.962f rather than the 1.970f I set it to. Here is a screenshot of the outcome if those changes are implemented. Left: The "popular" matrix; Right: FCC sanctioned matrix. Thanks. I actually used the matrix from nes_ntsc, which happens to be the same as on Wikipedia (quoted "popular" matrix). EDIT: The clamp rule seems to be rather heavily invoked. I wonder if this is a problem. Last edited by Bisqwit on Fri Oct 14, 2011 6:47 am, edited 1 time in total. To get the function you describe as correct they should be set .518f and 1.962f respectively. 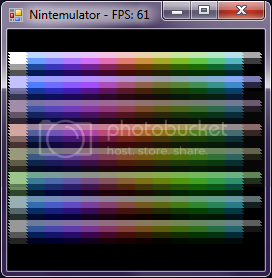 This does fix the issues, the palette does look great with games I have a good memory of from my childhood (I should note that I haven't seen an actual NES on a tube television for about 13 years). I should have noted that the two matrices are very similar, but there are some subtle differences. Most significantly are (2,1) and (2,2). And while the difference in output may be negligible, I still think it's proper to get the most accurate values. The clamp rule seems to be rather heavily invoked. I wonder if this is a problem. From what I can tell, you need to add in a check for NaN into your clamp function. This is sometimes generated when the value passed to pow(double) is negative. But clamping is necessary, and expected. Really amazing work! I've been looking for just such a function for quite a while now. Is anyone here able to confirm the behavior when multiple color emphasis bits are set? 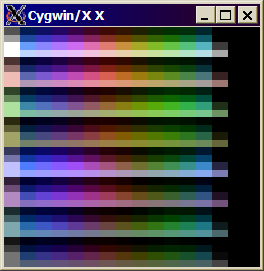 With that change, it'd be nice to have a definitive palette generator. Throw in a GUI to tweak some of the constants for user tastes, nes_ntsc for color bleeding and artifacts, and we'd be all set. Thanks. I updated the code in the opening post with this change and with the other changes discussed earlier. Here is a version with saturation and hue controls (as function parameters). I don't know what the tint control could possibly be that differs from hue. If you want to adjust the de-emphasis bits, they are the bits 6,7,8 of the "pixel" parameter. 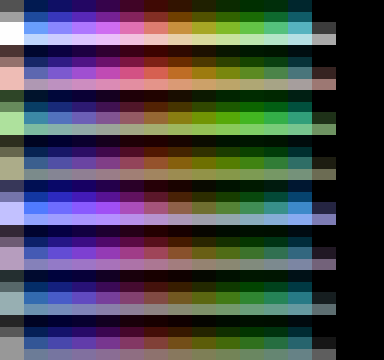 To adjust the hue by N°, pass N * 12 / 360 (e.g. 3 for 90°, -1.5 for −45°) as the hue_tweak parameter. Pass 0.0 as saturation to get grayscale rendering; 2.0 for super-poppy colors. EDIT: The attenuation explanation in the "NTSC video" article is ambiguous. In case there is simply just one attenuator that is selectively enabled at times, rather than three, one for each bit, the code to attenuate would be as follows [EDIT: Now included on the code above]. Last edited by Bisqwit on Fri Oct 14, 2011 2:50 pm, edited 7 times in total. I don't know what the tint control could possibly be that differs from hue. I believe that means that any of the three modulation channels can enable the attenuator, but the signal is only attenuated once. Ok. Made the single-attenuator code default, and added brightness and contrast controls. The single-attenuator code is mathematically unequivocal even in the presence of multiple de-emphasis bits. Now can someone confirm whether the outcome from this de-emphasis code actually agrees with observations on real hardware? I don't have a dev cart, or even an NTSC system to begin with. 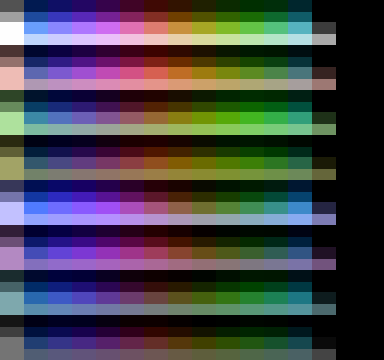 See this post for a picture of blargg's palette demo. The colors are in different order but otherwise it's looking pretty much the same as yours. I changed the color order to same as Blargg's and added the sawtooth scanline effect (the graphics is generated by native code, not NES code). Oddly, the color-de-emphasis bits are issued in a different order. I don't know why Blargg used that particular order. Are mine possibly wrong? His seem to be: none, blue, blue+red, red, red+green, green, green+blue, all; which is not binary; it's gray code. Mine is: none, red, green, red+green, blue, blue+red, blue+green, all. I added a saturation level of 1.15 to get better match. Last edited by Bisqwit on Sat Oct 15, 2011 4:00 am, edited 1 time in total. Could someone post a .PAL file of this, please? Must be 192 bytes, no color emphasis entries.